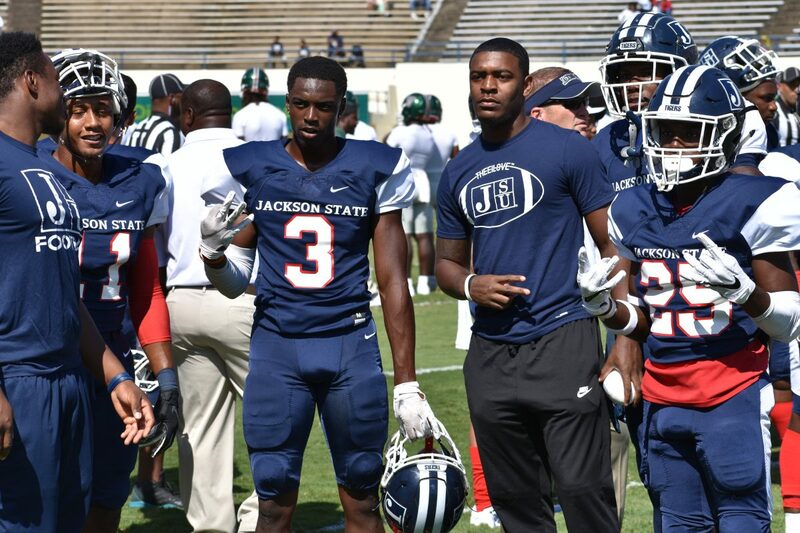 JACKSON, MS–The blue and white pompoms were shaking in full effect to the tunes of the “Sonic Boom of the South” as Jackson State’s offensive balance and strong defense helped the Tigers defeat Mississippi Valley, 23-7, Saturday afternoon at Mississippi Veterans Memorial Stadium. The excitement from Tiger players and fans was long overdue. With the win, JSU (3-2, 2-1) won its first homecoming game since 2015 and now sit second in the SWAC East behind its other in-state rival Alcorn State. Meanwhile, MVSU (0-5, 0-2) recorded their fifth straight loss and sit at the bottom of the division. Jackson State played with a sense of urgency and established a balance on offense early in the game that helped the Tigers record 335 yards of total offense (206 rushing, 129 passing yards) and 18 first downs opposed to Miss Valley, which finished with 194 yards and 13 first downs. Red zone scoring was the biggest factor in the Tigers’ success offensively, scoring on all four of their chances. JSU won the time of possession battle (35:08 to 24:52) and third-down conversions (6-of-15 to Valley’s 1-of-14), things that were a big concern for the Tigers in previous games. Jordan Johnson led the Tigers in rushing with 134 yards. Tigers’ quarterback Jarrad Hayes – who finished the game 16-of-22 with 129 passing yards, one passing, and one rushing touchdown – put the Tigers on the scoreboard first as he connected with Romello Shumake on an eight-yard touchdown pass, giving JSU a 7-0 lead. After forcing the Delta Devils to punt for the the third time in the game, the Tigers then put together a nine play, 84-yard scoring drive that saw running back Quitten Brown rush for 37 yards, a 19-yard run by Hayes and a 12-yard run from Johnson to set up a goal-line quarterback sneak by Hayes for a Tigers’ touchdown. In the second, MVSU put itself in long third-down situations – third and 20 and third and 10 – on its first two possessions in the quarter, forcing the Delta Devils to punt. Then, with 8:18 to play, the Tigers capped off a 12-play, 57-yard drive with a 34-yard field goal from kicker Christian Jacquemin to give JSU a 17-0 lead. MVSU looked to put some points on the board before the half but running back Isaiah Robinson was stopped by the Tigers’ defense on third and 1, forcing the Delta Devils to their fifth punt of the game. With just under minute to play in the first half, Keshawn Harper rushed for 10 yards on two plays while Hayes connected with Warren Newman on a 26-yard pass to set up Jacquemin’s 47-yard field goal to give the Tigers a 20-0 lead at halftime. Both teams were forced to punt on their first two drives to begin the second half. With 7:41 to play in the third, MVSU’s offense came to life. From their own 47, Delta Devils quarterback Jett Even connected with receiver Quinn McElfresh for 15 yards on second and 18 to move into Tigers’ territory. After several short runs by Dejerric Bryant, John Derrick Smith and a penalty, Even connected with McElfresh for 13 yards to the Tigers’ 35-yard line. Then, Bryant tossed a 24-yard touchdown pass to Smith, giving the Delta Devils their first and only score of the game with 2:52 remaining in the third. MVSU looked to build on its momentum but JSU kept its foot on the gas. On a drive that started from their own 14 with 2:41 to play in the third, the Tigers went 74 yards in nine plays that ended with a 28-yard field goal from Jacquemin – his third in the game – to give the Tigers a 23-7 advantage with 12:56 to play in regulation. From there, the Tigers’ defense held down the fort, forcing the Delta Devils to two turnovers on downs, an interception and a punt in their final four possessions of the game. Even led the Delta Devils in passing with 182 yards while wide receiver Booker Chambers led the receiving core with seven catches for 74 yards. Bryant also tossed a 24-yard touchdown pass to Smith. JSU returns to action Oct. 20 as the Tigers host North Alabama. As for MVSU, the Delta Devils will return home for a matchup against Arkansas-Pine Bluff.